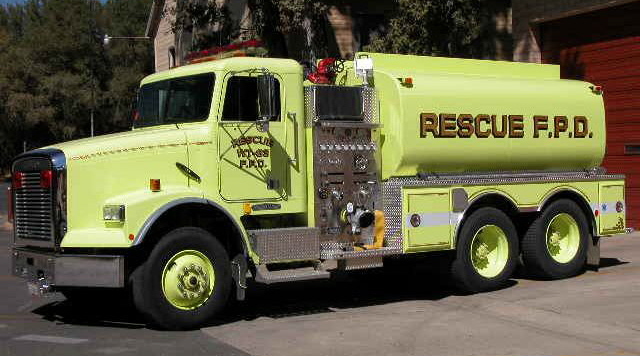 The Rescue Volunteer Fire Department was formed after the McDonald home that was located on Green Valley Road (currently the Smith Ranch) was destroyed by fire in 1959. Several local men including Merle Edison, Byron Hohberg, Clay Trumbly and Burt Wohlenberg formed the Department in 1960 as a non-profit corporation. The first Fire Chief, Clay Trumbly, and almost every man in the community was an original member. For the first year they did not have any fire fighting equipment other than simple hand tools. In 1961, a ¾ ton Dodge flatbed truck was donated as was a pump and 50 gallon tank. Once it was assembled the department had its first fire engine. The first fire station in Rescue was a retired El Dorado County High School District bus shed that was located on Green Valley Road, not far from where the main station is today. The bus shed was purchased by the department for $500.00 and was just large enough for one engine. On January 1, 1975, the Rescue Fire Protection District was formed as a taxing entity. In 1976, construction began on the current main station on property that was donated by the Wing family, it was finished in 1977. In 1982, Francis Carpenter became the first paid Fire Chief. In 1989, a second station was built in the north end of the District on property donated by the Webster family. The District currently has one staffed station, one volunteer station, four fire engines, one water tender, one rescue squad, two utility vehicles and one command vehicle. The District is managed by a five member Board of Directors, Fire Chief Dave Roberts, and Deputy Fire Chief Thomas Keating. The current staff consists of six paid members and eleven volunteer members. El Dorado County has ceased all funding of Fire Districts in El Dorado County. If funding is reinstated the funding will be utilized to reconstitute the Firefighter-Apprentice program. District members and other volunteers participate in the Rescue Volunteer Fire Association, which performs fund raising events that raise money for the District, college scholarships, and Boy Scout Troop 700. On October 1, 2013 the Rescue Fire Protection District (RFPD) and the El Dorado Hills Fire Department (EDHFD) entered into a "Shared-Services" agreement. This agreement allowed the Fire Chief from Rescue to provide administrative services to the EDHFD and in exchange receive 24/7/365 Chief Officer Coverage, Training, Fire Prevention, and Human Resources. On July 1, 2014 the agreement was further formalized to include the use of a single Fire Chief, and Deputy Fire Chief for both agencies. The agreement is for three-years with a 30 day "opt-out" clause for either agency.